Pollack and deKooning. 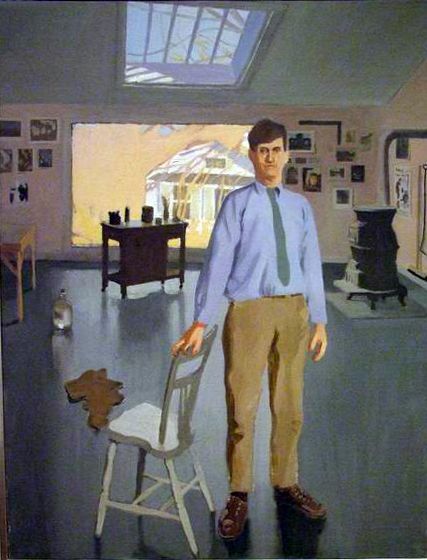 Fairfield Porter was both an art critic for the “Art News” and an accomplished painter. Portraiture and figure painting were losing the attention of New York galleries and the rest of America in the face of these new trends. Porter fought tenaciously to become a figure painter and not only succeeded but mentored younger artists while leaving a legacy of many paintings to the Parrish Art Museum near Southampton, Long Island, New York. Born 1907, Porter was the son of James Porter, an architect, and Ruth Furness Porter, a poet from a literary family. One of his brothers was Eliot Porter, a nature photographer. Their father , a wealthy man, bought an island Great Spruce Head island in Maine where he built his family’s summer mansion. Fairfield’s wife, a talented poet, was known as Anne Channing Porter of Southampton. After graduating from Harvard where he studied philosophy, he moved to New York City to study at the Arts Student League. Fairfield Porter has said that those who influenced his art the most were the French Impressionists: Edouard Veuillard and Pierre Bonnard. Porter saw in Veuillard’s paintings images of French domestic interiors with out the fine detail found in more Renaissance and classical art. He also appreciated Veuillard for his talent to paint some physical details without losing sight of the composition as a whole referring to Veuillard as the “abstract impressionist”. “the nature of pigment in the representation of vision”. Modelling as a method of creating form was much less important to Porter. promise in the art of Jasper Johns, Roy Lichtensein, and Bruce Marden. As a painter, his achievements included major group shows at the Museum of Modern Art in New York city and this museum also collects Porter’s paintings. He was reviewed by prominent journals as the Art Forum International Magazine, the New Yorker, and Art in America. Porter has donated 235 pieces of his art to the Parrish Art Museum of Long Island. His legacy resides in following the Realist tradition in art while mentoring younger artists as Eric Fischal through his words and paintings. Fairfield Porter’s study with Jacques Maroger in the 1940’s provided him with the know-how of mixing a medium to be used with oil paints to make them more fluid. Maroger’s medium is well known among painters. It consists of toxic white lead heated with linseed oil and mastic, a natural resin, which then becomes a gel. Once the mix is taken off the heat source, it cools after as hour to the color of Italian coffee, after several more hours : the color of American coffee. When used with oil paints on canvas, Maroger medium is transparent, blended into the hue of the pigment. Although Porter was meticulous in keeping records of painting recipes, his studio was kept in a style of creative liveliness with canvasses , paints, gels, easels, and brushes occupying its space. Realist tradition coupled with the openness of Abstraction gave the art world a fresh view of portraiture and landscape painting by this Yankee American painter.